So my friend Kyle sent me this... I thought it was kind of hilarious. There's no reset button here, no second chance. One slip, one lapse in concentration, and it's not only your own car that'll be reduced to splintered, pointy pieces, but potentially a million bucks worth of other people's metal, too. Not to mention the drivers. So why the hell is 23-year-old Lucas Ordoñez, an easygoing MBA student from Spain who'd never driven a race car until six months ago, behind the wheel of this 350Z in the middle of this nighttime scrum? And how the hell is he nailing lap after lap within a couple of tenths of his teammate, former F1 ace Johnny Herbert? 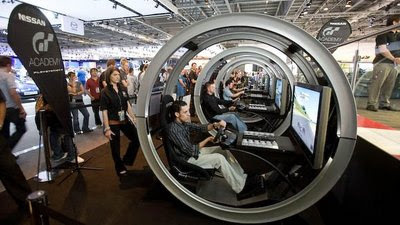 It's a debate most of us have had down at the pub: If you're quick on the PlayStation, will you be quick in real life? Darren Cox, Nissan's online guru, and Kazunori Yamauchi, creator of the Gran Turismo series, think so. 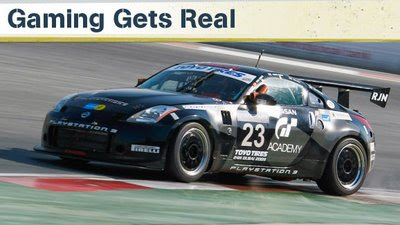 In fact, they decided to prove that a virtual racing champion can be turned into a real-life racing champion. And so begins the most expansive, most extreme virtual/reality racing experiment in history. A quest to put a top gamer into a top-level international GT race. A real one.